This white paper addresses the challenges companies face in fully visualizing their IT infrastructure in order to effectively monitor their essential technology implementations, configurations, and statuses. Without granular, real-time monitoring of the support stack, systems administrators become reactionary, spending the bulk of their time 'firefighting' problems rather than supporting the business. 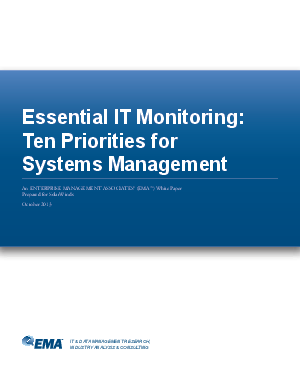 To assist organizations with establishing an effective monitoring process, Enterprise Management Associates (EMA) identified ten priorities that should be integral in every monitoring strategy.